Kirkey builds the finest, strongest, lightest and safest aluminum racing seats available today. Pit Stop USA is The Online Motorsports Superstore! We feature Drain Pans, Quick Change at low everyday prices. Pit Stop USA is The Online Motorsports Superstore! We feature Head & Shoulder Support Systems at low everyday prices. Pit Stop USA is The Online Motorsports Superstore! We feature Head Supports at low everyday prices. Pit Stop USA is The Online Motorsports Superstore! We feature Head Support Replacement Covers at low everyday prices. Pit Stop USA is The Online Motorsports Superstore! We feature Junior Seats at low everyday prices. Pit Stop USA is The Online Motorsports Superstore! We feature Kids Racing Seats at low everyday prices. Pit Stop USA is The Online Motorsports Superstore! We feature Kirkey 24 Series Seat Covers at low everyday prices. Pit Stop USA is The Online Motorsports Superstore! We feature Kirkey 36 Series Intermediate Seats at low everyday prices. Pit Stop USA is The Online Motorsports Superstore! We feature Kirkey 36/39 Series Seat Covers at low everyday prices. Pit Stop USA is The Online Motorsports Superstore! We feature Kirkey 36C Series Youth Intermediate Seat Covers at low everyday prices. Designed for 600 Micro Sprints, Mini Sprints. (For 270 Micros see 40 Series KIT) Available in five (5) sizes 12", 13", 14", 15" 16". Unique 3 part design for maximum vertical customization. Black vinyl or tweed cover for 38 Series seat. Fully padded quilted cover for comfort. Cover snaps on for easy removal and replacement. Pit Stop USA is The Online Motorsports Superstore! We feature Kirkey 39 Series Intermediate Seats at low everyday prices. Pit Stop USA is The Online Motorsports Superstore! We feature Kirkey 45 Series Road Race Containment Seats at low everyday prices. Pit Stop USA is The Online Motorsports Superstore! We feature Kirkey 45 Series Road Race Seat Covers at low everyday prices. Pit Stop USA is The Online Motorsports Superstore! We feature Kirkey 47 Series Road Race Seats at low everyday prices. Pit Stop USA is The Online Motorsports Superstore! We feature Kirkey 47 Series Seat Covers at low everyday prices. Pit Stop USA is The Online Motorsports Superstore! We feature Kirkey 56/58 Series Seat Covers at low everyday prices. Pit Stop USA is The Online Motorsports Superstore! We feature Kirkey 56LW Series Sprint Deluxe Seats at low everyday prices. Pit Stop USA is The Online Motorsports Superstore! We feature Kirkey 58 Series Lightweight Seats at low everyday prices. Kirkey Pro Street Drag Seat Cover - Black Vinyl - 18"
Kirkey 16 Series Economy Drag Seat - 16"
FREE SHIPPING! Oversized / Overweight Item. Ships from Michigan. Kirkey 16 Series Economy Drag Seat - 17.5"
Kirkey 34 Series Adjustable Child Containment Seat w/ Cover - 12"
Kirkey 34 Series Adjustable Child Containment Seat w/ Cover - 14"
Kirkey 36C Series Youth Intermediate Seat (Only) - 20 Layback - 14"
Kirkey 36C Series Youth Intermediate Seat Cover (Only) - Black Tweed - 14"
Kirkey 37 Series Black Cloth Cover (Only) - 12"
Kirkey 37 Series Black Cloth Cover (Only) - 13"
Kirkey 37 Series Black Cloth Cover (Only) - 14"
Kirkey 37 Series Black Cloth Cover (Only) - 15"
Kirkey 37 Series Black Cloth Cover (Only) - 16"
Kirkey 37 Series Micro Sprint Seat 10 Degree w/ Cover - 12"
Kirkey 37 Series Micro Sprint Seat 10 Degree w/ Cover - 13"
Kirkey 37 Series Micro Sprint Seat 10 Degree w/ Cover - 14"
Pit Stop USA is The Online Motorsports Superstore! Kirkey Racing Fabrication takes great pride in building the finest aluminum racing seats available. Kirkey Seats quality and comfort is proven on dirt and asphalt ovals, drag strips and road courses throughout racing. Kirkey is proud to have many of the top dirt and pavement drivers in the country using Kirkey Aluminum Racing Seats. Kirkey guarantees only the highest quality materials and workmanship go into each Kirkey seat. Kirkey builds the strongest, lightest and safest racing seat regardless of cost. The Kirkey Economy Layback Seat is Kirkeyas most inexpensive seat with great features Kirkey Economy Layback Big Boy Seat is designed for the larger racer. Kirkey High Back Kart Seat, Kirkey Child / Quarter Midget Seat Kirkey Mini Cup Seat smaller sized seats offer the same features as other Kirkey professional racing seats. Kirkey Intermediate Layback Seat is designed dirt and asphalt late model and I.M.C.A. Modifieds. Kirkey Vintage Class Bucket Seat was designed for vintage racing. Kirkey Deluxe Road Race Seat is for "door slammer" road course cars. Kirkey Intermediate Road Race Seat is for entry level road course cars. Kirkey Micro Sprint Seat and Kirkey Mini Sprint Seat are designed for smaller open wheel race. 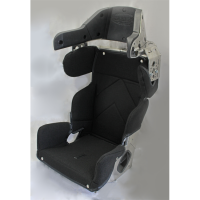 Kirkey Full Containment Layback Seat offers the latest in racing seat technology. A base, shoulder, and head unit are needed to construct the complete seat. Kirkey Open Wheel Full Containment Seat and Kirkey Full Containment Micro Seat comes with adjustable head and shoulder restraints. Kirkey Sprint Deluxe Upright Lightweight Seat is the ultimate in comfort and safety. 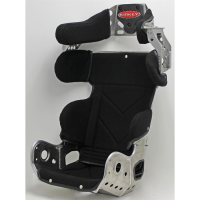 Kirkey Sprint Deluxe Upright Seat is the most advanced Kirkey sprint car seat. Kirkey Lightweight Layback Seat is designed to save weight. Kirkey Intermediate Upright Seat is an entry level seat for limited powered open wheel cars. We offer Kirkey Seat Covers, Kirkey Head Supports, Kirkey Shoulder Supports and Kirkey Leg Supports.